I've been pleasantly surprised lately by my 3½ year old daughter's willingness to eat whatever I put in front of her. We went through that awful stage of newly discovered independence where she said no to just about everything on her plate for the simple fact that she could. The whole theory of "I can say no, so I will". (Thank goodness that's passed.) Now it's as though we've developed a kind of trust. I tell her, "don't worry, it's good. You'll like it" and in the mouth it goes. Score. One point for Mom. I've been trying to take advantage of this unexpected, but welcome phase by giving my daughter plenty of variety included in her meals. Now, don't get me wrong, she (almost) always eats what my husband and I eat for dinner and always has. Sometimes her plate might be a bit deconstructed or minus one or two things, but I've almost always kept her in the back of my mind during preparation so I don't have to prepare two separate meals. 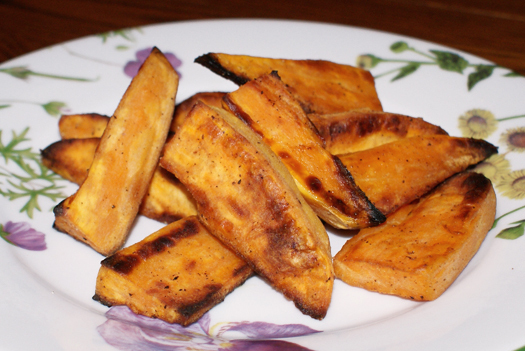 These sweet potato wedges are one of the foods that she has recently eaten where she didn't even hesitate to take the first bite, which of course thrills me. I'd rather her have sweet potato fries (or wedges) than regular fries any day. Bonus: my husband loves them, too. Make that two points for Mom. Peel your sweet potatoes. Cut them in half lengthwise, then each half into 4 wedges. Then cut each long wedge in half to make two shorter wedges. Bake in the preheated oven for 15 minutes. Remove from the oven and flip them over. Bake for an additional 5 minutes. Make sure you're on the ball with the timing on these! A few extra minutes will result in black wedges. A few black spots and black crispiness around the edges is good and expected (and won't effect the taste), but if you leave them in too long they'll be little charred wedges and that's not what we're going for here!